We’ll show you how to disable it with a few simple steps. HP’s Cartridge Protection feature first started appearing with the HP OfficeJet Pro 8600; it soon began appearing in the Photosmart 5520 series, among others. As we said, it is designed as a protection against counterfeit products masquerading as Genuine HP products. 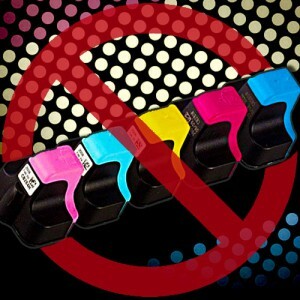 This system will alert users that the cartridge is not genuine, and it will also block the cartridge from being used. This is good news for identifying counterfeits. However, it’s an aggravation for users who are blocked from using their legitimate remanufactured and compatible ink cartridges. We’ve covered the many benefits of remanufactured ink cartridges before, and for buyers looking to save money, this can be a real problem. When trying to use remanufactured ink cartridges with these models, the best solution is to disable Cartridge Protection. If you later wish to verify that a cartridge labeled as a Genuine HP product is actually genuine, you can always re-enable the feature. Here are the steps. Click the Start button, and click Devices and Printers. Find your HP printer in the list and double-click it to open the Settings page. Click the text for Estimated Ink Levels under the heading of Shopping Resources. This will open the HP Toolbox window. Click the tab for Cartridge Protection. Click the radio button next to Disable HP Cartridge Protection. Click the Save Setting button to save your new setting. Then, close the window. You may need to remove and reinstall the cartridge for it to be recognized properly. Find your HP printer in the list and right-click it, then look for the IP address in the Location field. Copy and paste the IP address into your web browser and hit Enter. The embedded web server for your printer should open, with several options to change. Click the Settings tab at the top, then click Cartridge Protection in the left column. Click the radio button next to Disable Cartridge Protection, and click Apply. You can now close the browser. While the HP Cartridge Protection setting is useful for identifying counterfeit printer supplies, it goes a bit too far in blocking users trying to save money with remanufactured and compatible supplies. Luckily, you can disable the setting using the steps above, and if you ever suspect you have a counterfeit supply, just re-enable the setting in order to test it properly.